RED DEER, Alta. - Last fall's mass floor-crossing by several members of Alberta's Wildrose party was the focal point Monday night as the three candidates vying to become the party's next leader made their first public pitch for support. Drew Barnes, Linda Osinchuk and Brian Jean were in Red Deer for the first in a series of debates leading up to the announcement of the new leader later this month. 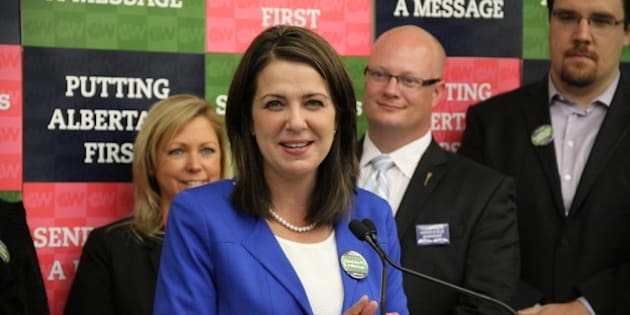 All three used the event to criticize former leader Danielle Smith and 10 other Wildrose members who crossed the floor to the governing Progressive Conservatives. Jean, a former northern Alberta Conservative member of Parliament, told the gathering that the crossing is an opportunity to affirm what Wildrose is about. Osinchuk says the people of Alberta need to be in charge of their future, while Barnes says the floor-crossing was Smith's failure to keep the party united. The Wildrose leader will be announced March 28. The candidates also used the gathering to talk about why their personal and political backgrounds are best suited for the role of leader. Barnes, the MLA for Medicine Hat-Cypress Hills, said being with the party for five years makes him the best candidate because he's in touch with the party's roots. Jean said he would make the best leader because he's an experienced lawyer who was a Conservative MP in northern Alberta for 10 years. Osinchuk says the fact she's a mother, a nurse and a former municipal politician in the Edmonton region gives her an edge because she can take a balanced and caring approach to government spending and cost-cutting.